A kiddy ride featuring the characters "Rosie" and "Jim" from the TV show. In the "Peek-A-Boo" version of the ride pop-up dolls of Rosie and Jim, appear randomly. 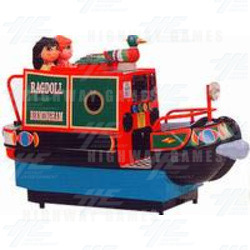 In the video version of the ride 4 specially commissioned videos featuring Rosie and Jim, are shown on the 15cm LCD screen provided which features digital playback.